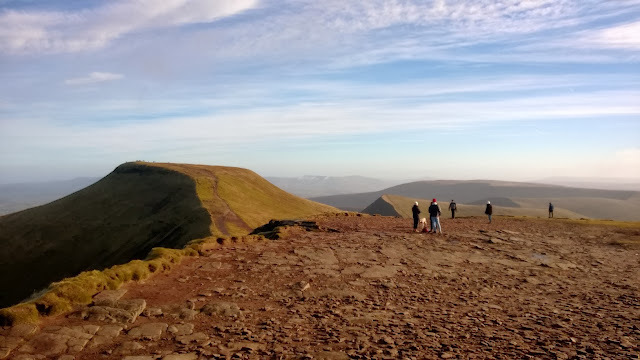 We arrived at the car park just before 9am and I spent a while packing bags and checking kit items and clothing as well as explaining the route that we'd be walking after deciding to take the clockwise route around the horseshoe so that we didn't have to descend the gully after Corn Du - Jodie isn't too keen on heights and while there isn't a great deal of exposure along the route I thought it would be easier to walk up this section rather than get to the end of the walk, tired, and have to negotiate a path down it. 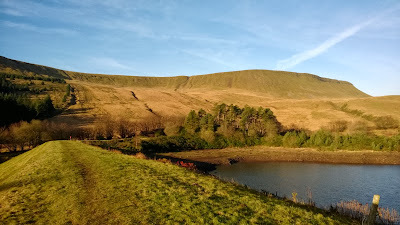 The weather was clear, bright and chilly (around 0-2C) but with some brisk (30mph ish) winds forecast on the higher grounds. After leaving the car park and passing the lower Neuadd reservoir (in which the water level was lower than I've ever seen it) we headed on a fairly direct route across the fields (which were, in places, slightly boggy underfoot) towards the gully, topped with a cairn, that climbs up to the plateau. As the gully loomed in front of us there were some noises of uncertainty as it always looks steeper and more ominous from afar that it actually is when you're climbing up it - the climb up was uneventful and we reached the cairn at the top and paused to admire the view back down across the reservoirs and catch our breath. 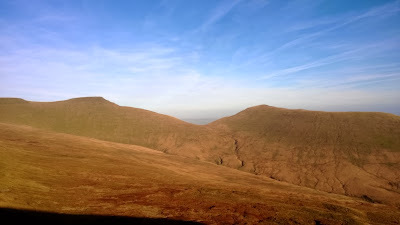 Once up onto Graig Fan Ddu the path (fairly muddy in places) follows the edge of the fairly wide plateau and you head NW towards the head of the bwlch before bearing NNE and climbing towards the summit of Corn Du (873m). 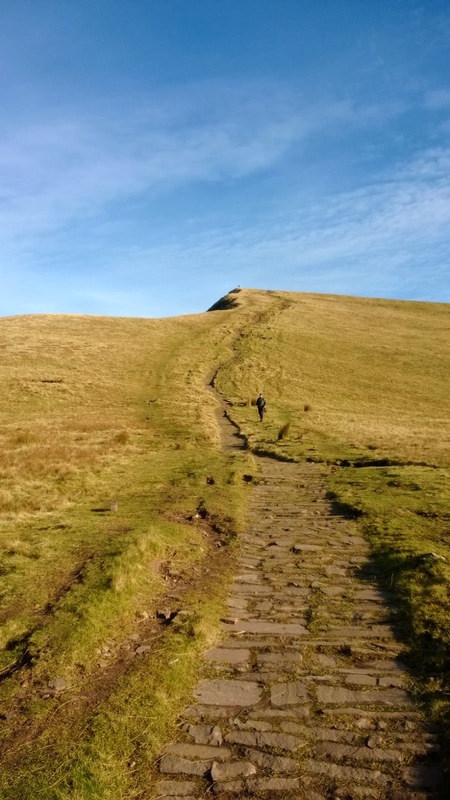 The wind along this section was both cold and farily stiff and we stopped to add extra outer layers and hats before carrying along this section which stretches for around 2km. 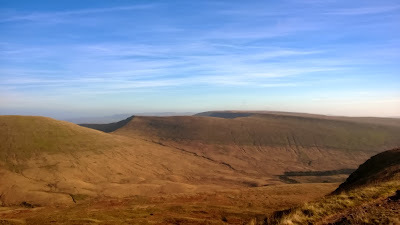 One strange phenomenon is that, with certain wind directions, and due to the way the wind moves across the plateau and up both sides of the ridge there are a few sections where you can be almost totally out of the wind as it collides above you leaving you with a feeling of being inside a glass box and watching the grass blow around you but somehow leaving you untouched - this is even more impressive in the snow as you can almost be walking along in a tunnel with the snow blowing around and above you from either side. After the short, sharp, climb to the summit top of Corn Du we descended slightly before climbing again to the summit of Pen-y-Fan (886m) which stands as the highest point in the Brecon Beacons and a fairly busy intersection between people walking the horseshoe route and those arriving from either of the northerly paths. As the wind had abated slightly and the sun was trying its best to shine we stopped for lunch and hot coffee courtesy of the JetBoil. After a well deserved lunch break we headed down from the summit via the fairly steep rocks and stepped path that has been added to save the ground from hoards of walkers and hikers. 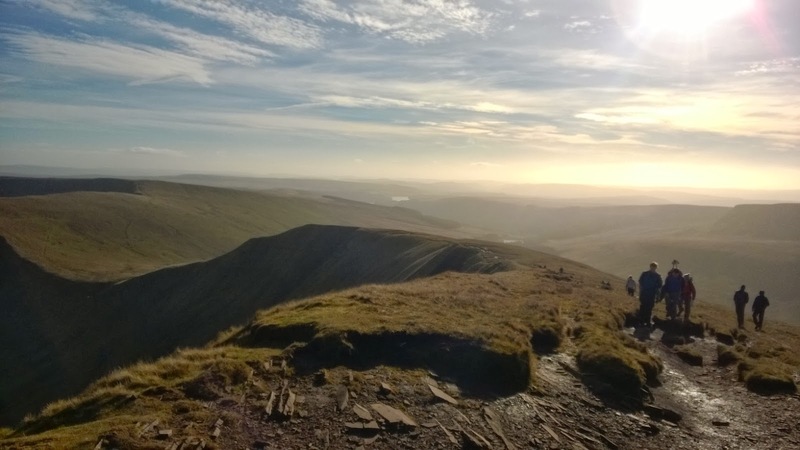 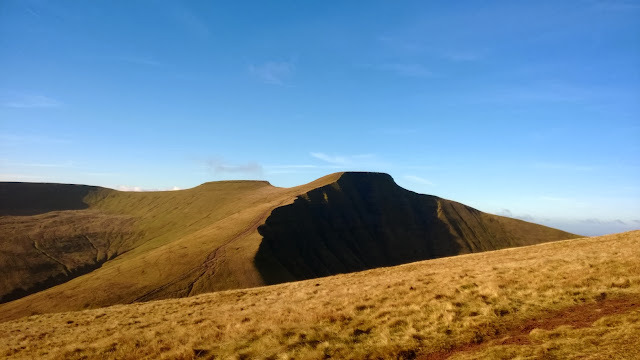 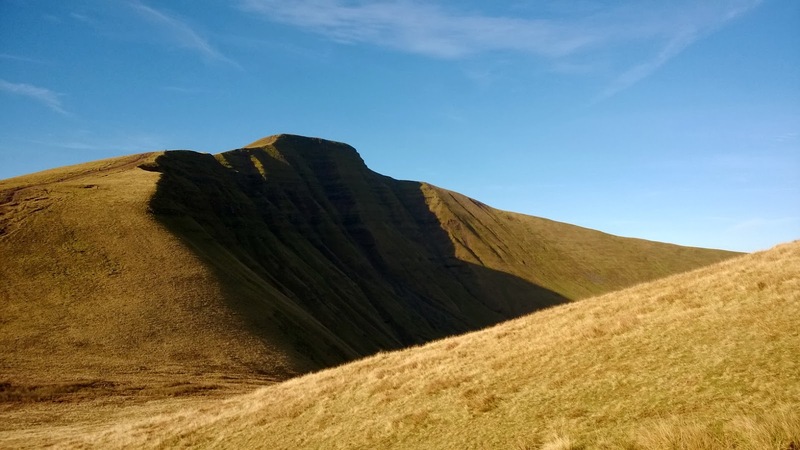 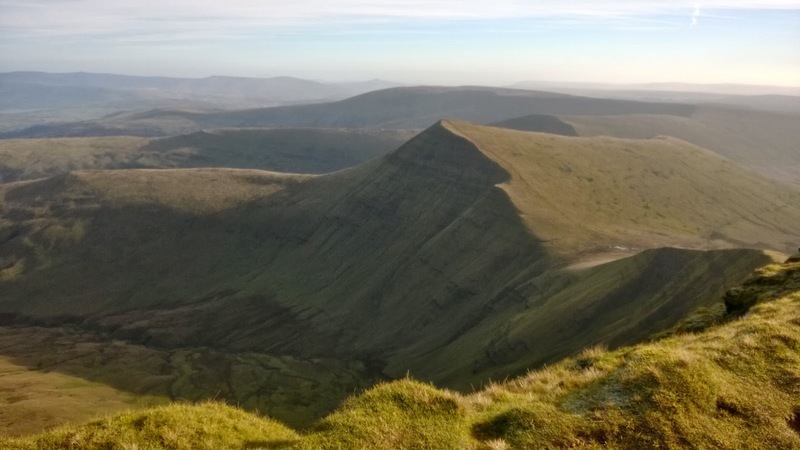 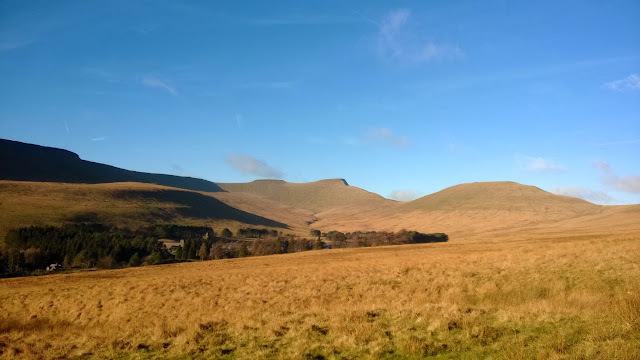 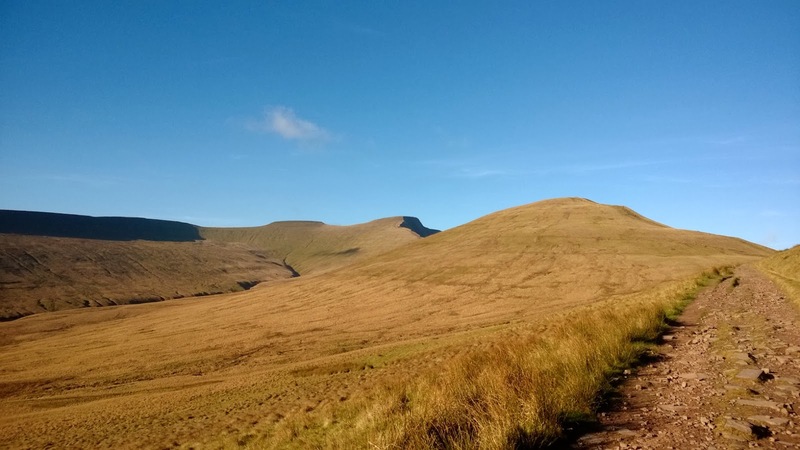 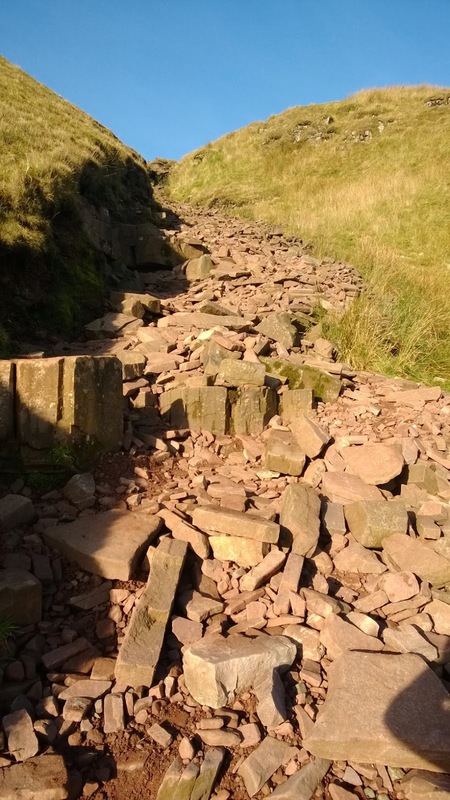 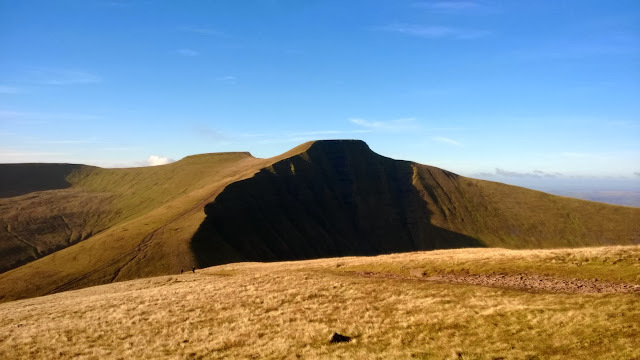 It's always slightly demoralising walking this bit as you quickly loose all the height you fought to gain down to the saddle between Pen-y-Fan and Cribyn before climbing steeply back up to the summit of Cribyun (795m). 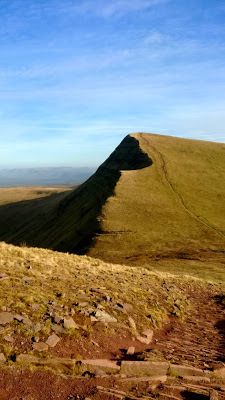 But, as always, the views more than make up for it looking back on to the NW face of Pen-y-Fan is amazing and always seems of offer up a slightly different colour and photo opportunity than the time before. 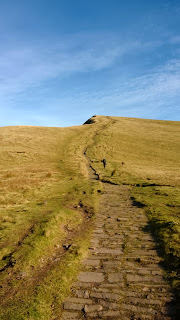 From the summit of Cribyn the path drops down to meet the roman road in the saddle (599m) and from here you can, as I have on a previous walk, carry on up to Fan-y-Big (719m) and on to complete a larger circular walk of around 12 miles but today's plan was to pick up the roman road and follow this back across Tor Glass to the east of the Neuadd reservoirs before finding the shelter of the trees again and then dropping back down to the car. 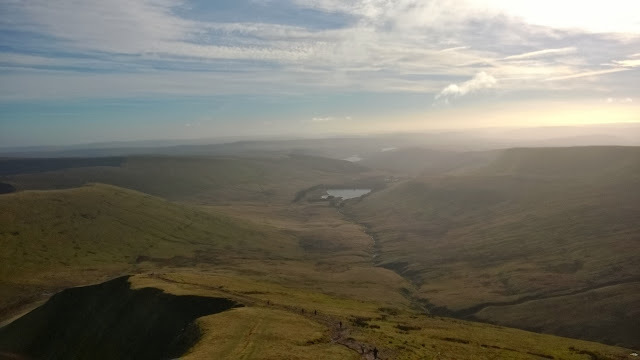 All in all the walk was a success despite the poor attendance and we managed to complete the 13.8km in a shade over 4 hours with 700m of elevation gain thrown in for good measure. 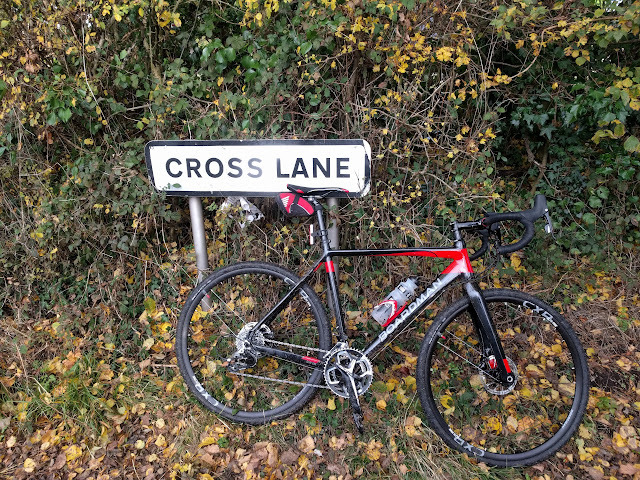 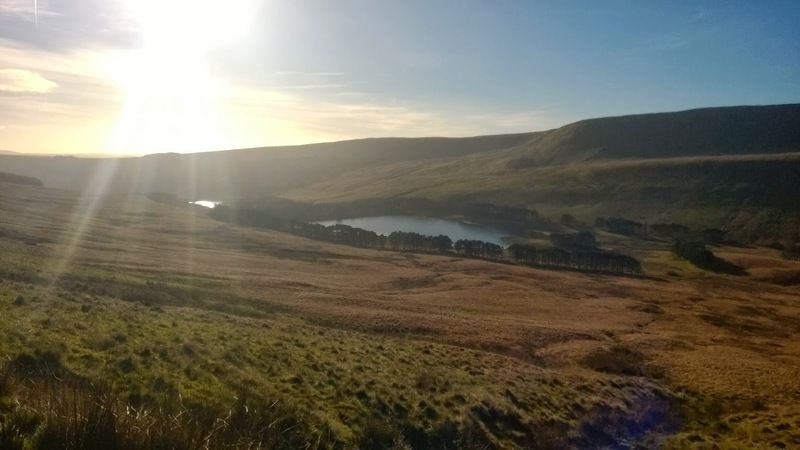 It was a good chance to experience the hills in farily good weather, test out new kit and see first hand just how different the temperature can be when you add a 20-30mph breeze into the equation at 700+ meters. 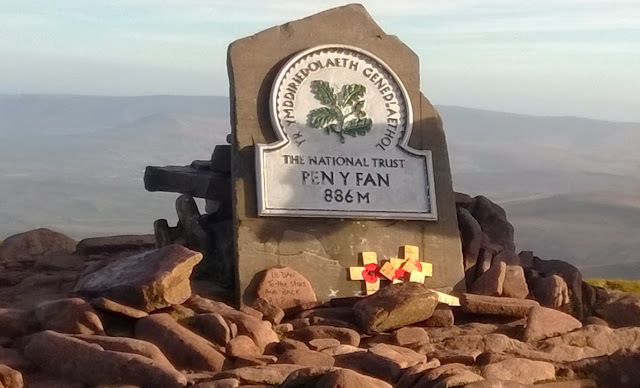 We left Pen-y-Fan with Jodie more determined to increase her fitness and to come back into the Brecon Beacons over the coming months to experience the snow and I for one am keen to do the same!